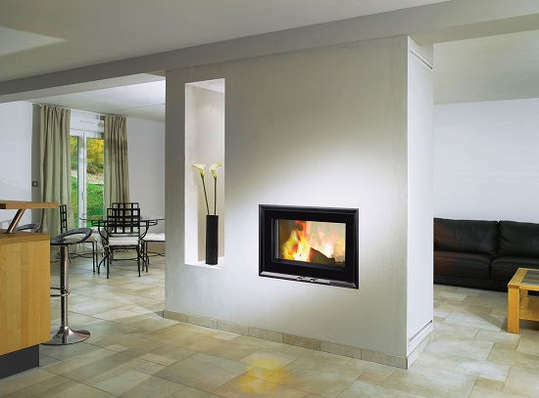 This wood-burning double-sided stove is ideal for installing in a wall that separates rooms, or it can be built into its own masonry block as a feature within a room. Burning at 78% efficiency and giving out 11kW, the V80 LDF will heat two small-to-medium-sized rooms or one medium-to-large-sized room. However, the stove is extremely controllable and can burn giving out just a few kilowatts. Robustly built with a high-quality steel interior, the V80 LDF has a sleek, contemporary design with a large, self-cleaning glass window and a side-opening door with a stay-cool silcone handle. To give the stove a seamless finish, we also offer a black bevelled frame.